US President Donald Trump and North Korean leader Kim Jong Un cut short their two-day summit in Hanoi without reaching a deal on the North's denuclearisation. During a post-summit press conference, Mr Trump said he had to "walk away" from the talks with no deal as Mr Kim had demanded the lifting of all sanctions on Pyongyang while suggesting denuclearisation steps that fell short of what the United States wanted. North Korea appears to have sought as many concessions as possible from the US in exchange for decommissioning its Yongbyon nuclear complex. Mr Trump was right to leave the summit with no deal rather than a bad deal. His decision puts to rest concerns that he might settle on a deal with Mr Kim that would give diplomatic rewards and partial sanctions relief to the Kim regime in return for limited measures on dismantling its nuclear arsenal. The Hanoi meeting was meant to put flesh on the scant achievements from the first summit between Mr Trump and Mr Kim in Singapore last June. The Singapore summit produced a vaguely worded accord, with both leaders agreeing to work towards the "complete denuclearisation of the Korean Peninsula" without specifying what this would entail. The possibility of significant progress being made this time around was not high. Mr Trump appeared to be managing expectations ahead of the summit, saying he was in "no rush" to push for denuclearisation. Negotiating teams from the two sides are expected to resume talks in a bid to set the stage for a possible third summit between their leaders. With a comprehensive deal on the North's complete denuclearisation pushed back again, it is uncertain how ready the Kim regime is to relinquish its nuclear arsenal, which it sees as essential for its survival. He has now put himself in what seems to be an advantageous position of waiting for the North's response to US demands for additional steps towards dismantling its nuclear and long-range missile arsenals. At the press conference joined by US Secretary of State Mike Pompeo, Mr Trump said he has not committed yet to another summit with Mr Kim, adding that the "next meeting might be soon, might not be for a long time". Meanwhile, negotiating teams from the two sides are expected to resume talks in a bid to set the stage for a possible third summit between their leaders. With a comprehensive deal on the North's complete denuclearisation pushed back again, it is uncertain how ready the Kim regime is to relinquish its nuclear arsenal, which it sees as essential for its survival. In his call to South Korean President Moon Jae-in from his plane en route to Washington, Mr Trump asked him to "actively" facilitate future dialogue with the North Korean leader. In this regard, South Korea should assume a more active role in the process of denuclearising the North, not just as a mediator between Washington and Pyongyang. Seoul must also guard against Pyongyang's attempt to use a possible peace declaration with Washington as a way to eventually engineer the drawdown of US forces in South Korea and lead the two Koreas to the goal of reunification on its terms. Mr Kim was quoted recently by a former US intelligence official as telling Mr Pompeo on his visit to Pyongyang last year that he did not want his children to "carry the nuclear weapon on their backs to live through their entire life". This could be interpreted as suggesting he intends to retain North Korea's nuclear capabilities at least for his generation, which would make it hard to remove sanctions on the impoverished North. If he chooses to return home to Pyongyang on the train that took him to Hanoi, travelling about 4,000km over two days, he may have time to think again about what choice would best serve the interests of his children. After his meeting in Hanoi with North Korea's top leader Kim Jong Un was cut short, United States President Donald Trump said that "sometimes you have to walk", and that "this was just one of those times". Certainly the two leaders greeted each other with warm smiles and handshakes when they met. But Mr Trump said that Mr Kim wanted too much by demanding a complete lifting of US-led international sanctions in exchange for the closing of the Yongbyon nuclear facility. This gets to the heart of the matter: Washington sees the sanctions as tools of coercion, and has demanded that Pyongyang do something "meaningful" to denuclearise before it offers sanctions relief. When asked whether he was ready to give up nuclear weapons, Mr Kim said: "If I wasn't ready for such a thing, I wouldn't be here." However, he wants the sanctions to be lifted in one fell swoop. Given that Mr Trump did not close the door on a deal in the future, and said that he would meet Mr Kim again sooner or later, it may be that he simply ran out of time to talk because he had to turn his attention elsewhere. Certainly, from the Singapore summit last June to this week's Hanoi meeting, the dramatic rapprochement between the US and North Korea - seemingly immutable adversaries - would not have been possible without the strong political will for engagement demonstrated by both sides over the past year. Each time this has appeared at risk of being lost, other important players involved in the denuclearisation of the Korean peninsula, in particular South Korea and China, have provided the necessary will and support to keep the engagement alive. They will no doubt be offering their support this time, too. Although the high hopes for the meeting have not been met and there is a sense of disappointment, the high-level contacts between the two sides are likely to continue. So it would seem a deal is still on the cards - it just needs more time to put the pieces in place. It can be said that North Korea has been clearly pursuing a strategy of seeking sanctions relief without going ahead with complete denuclearisation. Washington had every reason to avoid concluding a rough-and-ready agreement and to decide on continued negotiations. It must brush up on its negotiation strategy. Yongbyon, which is a complex of graphite-moderated and light-water nuclear reactors plus nuclear reprocessing facilities, is capable of producing plutonium and highly enriched uranium. Its dismantlement would have great significance, but there are nuclear facilities in places other than Yongbyon. Nuclear bombs and ballistic missiles that have already been produced should be included in a list of items subject to dismantlement. To realise complete denuclearisation, it is necessary to grasp the full reality of the North's nuclear and missile facilities and formulate a road map leading to their dismantlement. 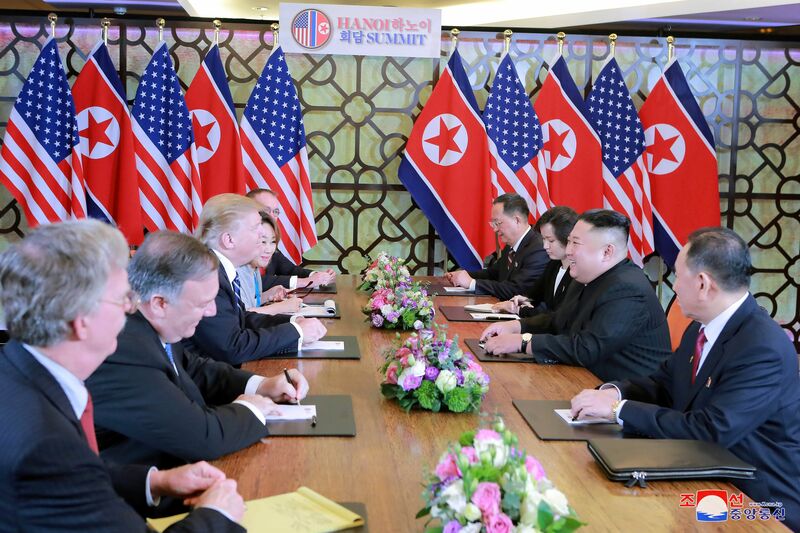 Washington and Pyongyang are called on to work out details in their working-level talks on procedures and timetables for dismantlement and the provision of rewards. It is concerning that the Trump administration lacks experts and senior government officials who are experienced in denuclearisation negotiations with North Korea. President Donald Trump should recognise that engaging in top-level diplomacy reliant on gut feeling and improvisation is extremely risky. Mr Kim Jong Un once again told Mr Trump of his plan to refrain from conducting nuclear tests and ballistic missile launches. It is crucial that Mr Kim keeps this promise and makes the decision to completely denuclearise. For all the grandstanding at the previous night's dinner table, Thursday's summit between US President Donald Trump and the North Korean leader Kim Jong Un was a non-starter. It turned out to be an exercise in competitive obduracy. In the net, the confabulations at Hanoi's high table registered little or no forward movement… so very unlike the Singapore round last June. The failure of the Vietnam round reaffirms that there is no common ground on the fundamentals of the respective geo-strategies. The written statement of Ms Sarah Sanders, the White House spokesman, was a feeble attempt at obfuscation. "The two leaders discussed various ways to advance denuclearisation and economic-driven concepts. No agreement was reached at this time, but their respective teams look forward to meeting in the future." Suffice it to register that Mr Trump has ruled out a third summit despite Mr Kim's assurance that North Korea would continue to hold off on nuclear and missile tests. The world, especially East Asian countries, including South Korea, Japan, North Korea and even China, should feel relief at the failure of the Hanoi summit. A major success in the summit could have been devastating because it could have created a too-sudden change in the global power equilibrium. A fruitful summit could indeed have given US President Donald Trump justification to withdraw US military forces from South Korea and Japan while the two countries remained unprepared to fully protect themselves. Mr Trump has forced Seoul to pay 1.03 trillion won (S$1.23 billion) for its military protection for this year and asked Japan to pay more. Some diplomats and international media had - wrongly - predicted that Mr Trump and North Korean leader Kim Jong Un would declare an official end to the Korean War. They also predicted that Mr Trump would announce the lifting of the severe United Nations economic sanctions in exchange for Mr Kim's readiness to abolish his nuclear ambitions. As reported by Bloomberg, South Korean stocks plunged and the currency weakened after the summit. The benchmark Kospi index closed 1.8 per cent weaker on Thursday, while the won slipped 0.5 per cent. So-called peace stocks, a group of South Korean infrastructure names that had rallied on hopes that a positive outcome from the summit might lead to new business opportunities in North Korea, also fell. Thursday's meeting with Mr Kim was disastrous for Mr Trump. A success in taming Mr Kim would have been sweet revenge against the Democrats, who humiliated Mr Trump during a public hearing with his former private lawyer and "fixer" Michael Cohen in Congress just a few hours before the summit. It was damaging for the President. The Democrats succeeded in distracting Mr Trump's focus as Cohen characterised his former boss in diabolical terms. Mr Trump's ambition to win the Nobel Peace Prize collapsed with Mr Kim's stubborn refusal to destroy his nuclear facilities. He wrongly thought that he could persuade Mr Kim to give up his nuclear weapons just by flattering him as a great leader and predicting North Korea's economy could surpass Vietnam's once he abandoned his nuclear agenda. Even Chinese President Xi Jinping could not dictate to Mr Kim despite the North's almost total economic dependence on China's generosity. What the world urgently needs right now is not a nuclear-free North Korea. A much more predictable North Korean leader, who acts normally as the leader of a normal country, is a more realistic expectation. Credit should go to South Korean President Moon Jae-in, as his sincere and tireless efforts have convinced Mr Kim to shift to economic development in order to survive and stop threatening the world with his nuclear weapons. Although denuclearisation remains elusive, the Korean peninsula is a much more conducive place now as tension between the two countries has largely declined.